Moist heat pads made of silica gel properly sealed in the pads for regular use in moist therapy units, long life pads, available in different sizes and shapes according to use of body area. As a part of our innovation we are now offering the new concept of hot and ice gel pack. The product is widely used in cryo therapy. 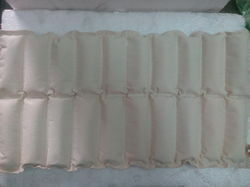 We are manufacturer and supplier of Easy Ice Hot and Cold Pack with Multipurpose Belt. Kindly find below features of Hot and Cold Pack with Multipurpose Belt. We have gained acknowledgment as a distinguished enterprise, devotedly affianced in offering a comprehensive Hot and Cold Pack. We are trader and supplier of Hot and Cold Pack. An effective method for applying localized Hot/Cold therapy. Once chilled or boiled, microwaved pacs retain their therapeutic value for about thirty minutes. Packs remain soft and pliable even below freezing and moulds to body coutours. Thera Pearl Pals is perfect for Common Aches, Swelling, Bruising, Headaches, Bee Stings, Fever Reducing, Minor Scrapes or Burns, Ideal for the eyes, cheek and wrist.